Risotto is the heart of the North Italian kitchen. Risotto alla Milanese is Milan's famous risotto, which is traditionally made sauteing in butter chopped onions and meat, then adding first Carnaroli rice and then white wine. 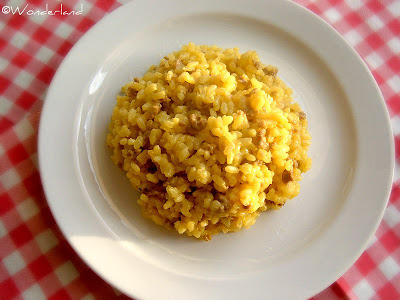 Risotto is cooked slowly with beef stock, adding saffron half way and parmesan cheese and/or butter at the end before serving. There are many different versions of it, for example with zucchini, salsiccia (Italian sausage), gorgonzola cheese, mushrooms, asparagus and frogs! I'll share with you the version made with minced meat, which is not too difficult to prepare. I often add mushrooms to it, e.g. champignons. Making a good risotto is quite easy, but it's a slow process that requires time and attention. You cannot just simply go to watch TV and let the risotto cook alone, because that would come out a mess. Instead you have to keep stirring and stirring otherwise the rice sticks to the bottom of the pan and add stock little by little, having the patience to wait that the rice has absorbed all the liquid before adding more stock. In a saucepan heat some oil over medium heat. Add finely chopped onion and saute until it gets soft. The add the meat, mashing it with a fork and stirring. Add salt and pepper. Simmer the onion and meat for about 5 minutes. Add the rice and stir for a couple of minute, until lightly toasted (it will look translucent). Stir constantly so the rice will not stick and burn. Add enough broth that it covers all the rice and stir. Pour the saffron powder in a bit of broth, mix with a teaspoon and add it to the risotto. When the rice has absorbed almost all the broth, add a ladle of stock. Keep adding ladlefuls of broth, allowing each ladleful to be absorbed before adding the next, until the rice is cooked and has creamy texture. This takes about 20 minutes. Check the taste, add salt and pepper up to taste. If you want you can add now a spoonful of parmesan and a spoonful of butter, always stirring. When the rice is cooked, remove from the heat, cover and let sit for a couple of minutes (this way the risotto gets its fluffy texture). Serve with grated parmesan cheese.